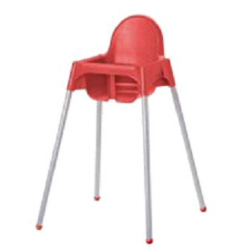 Home furnishings firm IKEA is recalling the safety belts from some 1.2 million Antilop high chairs sold in 46 countries -- including Canada. "The high chair belt can open unexpectedly in use, creating a fall hazard," IKEA Canada said in a statement released Thursday morning. The recall comes after IKEA learned of eight incidents involving babies and toddlers falling out of their high chairs. Three children sustained minor injuries in the falls. While there have been no incidents in Canada, about 36,000 chairs sold in Canada are affected by the recall. The chairs sell for $19.99. The belt was manufactured between July 2007 and November 2009 and has production code dates between 0607-0911 (YYMM). IKEA Canada is advising all customers who have an Antilop high chair to check the belt tag to see if it came from supplier 17389 and has those production code dates. If it does, owners should immediately stop using the chair and visit an IKEA store for a replacement belt. For additional information, customers can contact IKEA toll-free at (800) 661-9807.